Jim Cronin, the founder of Monkey World ape rescue centre, has died aged 55. Mr Cronin died in hospital in New York on Saturday afternoon after a short illness. Monkey World, near Wool in Dorset, was set up in 1987 to provide abused Spanish beach chimps with a permanent home. The centre, which is home to 150 apes of 15 different species, is now at the forefront of a worldwide campaign to stop the illegal smuggling of apes. 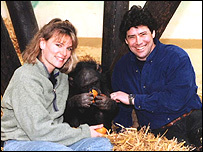 Mr Cronin and his wife Alison established the centre's worldwide reputation for excellence in primate rehabilitation. They also worked with governments to rehome abused animals and campaigned to stop the illegal hunting, smuggling and sale of endangered species.